Pro-Ject Debut S/E3 review | What Hi-Fi? Pro-Ject’s Debut has been a major player in the budget market since it first appeared in 1999. Now in its third generation, this deck continues to set high standards. The S/E3 we have on test is a UK model and has some notable upgrades – the most obvious being the black gloss finish more usually found on Pro-ject’s pricier products. Look further and you’ll find a multitude of engineering upgrades. 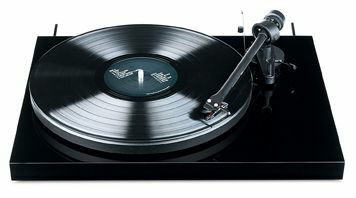 The platter is larger and the arm bearings are of a higher grade, and there’s also an upgraded motor that’s better decoupled from the plinth, a new belt and a detachable turntable interconnect that opens up the deck for fettling. The cartridge, an Ortofon Super OM10, is better than the standard one, too. All this sees the turntable move up a sonic level, but the well-balanced character of the original hasn’t been lost. The S/E3 remains highly listenable, just adding an extra dose of insight and precision into proceedings. It sounds a touch lean, but never enough to upset; the upside is plenty of detail and the ability to tie the strands of, say, Holst’s Mars, into an engaging whole. Pleasingly, this deck has the punch and excitement to satisfy with the likes of Nirvana as much as its refinement and resolution impress with classical music. The S/E3 is as easy to use as any Debut, and has a feeling of extra polish. It’s a great alternative to the Award-winning Rega RP1.